Question: I noticed the nifty avatar on your blog. How do I make Voki appear as a widget on the sidebar of my WordPress blog?? Answer: There are a few ways to do it. In this post, we’re going to walk you through one of the easier ways. Below, we show you the easiest way to make your Voki widget work without using a third-party. You’re only minutes away from having a Voki greeting on your WP homepage, ready to greet your readers! 1. 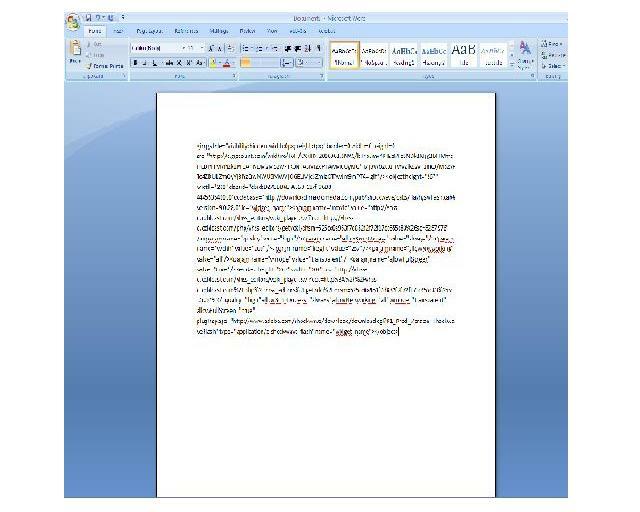 Open a Word document or other text editor. 2. Log in to Voki and WordPress. 3. In WordPress, go to the “Appearance” tab, and select the “Widgets” option. 4. Look at your widget options. Choose the “Text” widget and drag it to the sidebar display of your choice. 6. Copy the entire embed code. 7. Paste the code in your open Word document. 8. In the Word doc, highlight the source code, or “src” code. This can be found by locating src= and highlighting the hyperlink that is in between the quotation marks (it’s a pretty long link, so make sure you copy everything in between the quotation marks). See the example below. 9. To make sure you copied the link correctly, paste the highlighted link into your internet browser (but not this window or tab!) and press Enter. Your Voki should appear on the page in full screen (pretty cool!). 11. Copy and Paste your new embed code from the Word doc, into the WordPress Text box (and click Save). 12. Check out your blog! Your Voki should be happy to greet you! 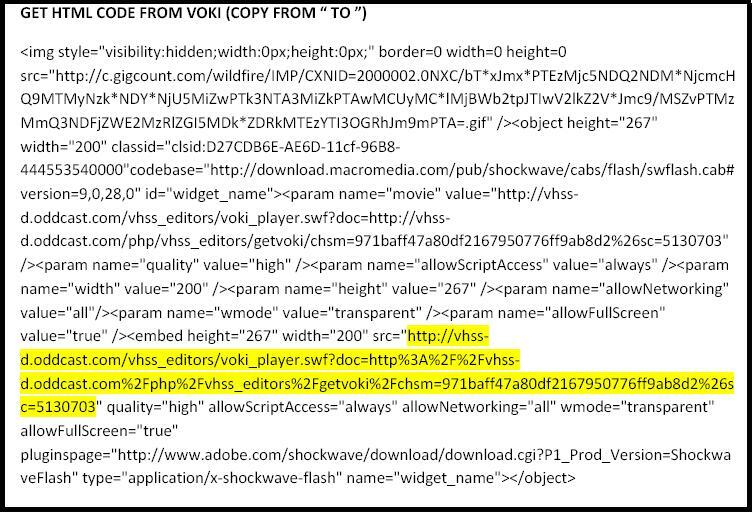 TIP: If you don’t see the Voki, and you’re certain you followed the steps correctly, try clearing your browser’s cookies and cache, and reopening the page. For those of you with WordPress blogs, we hope this helps you out! If you know of an (even) easier way to make Voki work with WordPress, please share it with us below in a comment! And, if you have any ideas for future Voki Tip of the Week posts, feel free to share them below, and we’ll add them to the list! Have you seen Voki Classroom? Check out the new Voki classroom management system, and the intro video, right here. I’m trying to get my Voki published on my blog (WordPress). It says I haven’t created a blog, yet, but I have. Hope you can help. As long as you have logged on to WordPress and gone to the dashboard of your blog, the instructions we have provided above should work. Did you follow the instructions in this post? I am logged in at WordPress, I have a new blog post open, I have my dashboard open. It says: “Post failed – please set up a blog”. I could send you a print screen if I had your email address. I understand where you are having your problem. Unfortunately, publishing your Voki to WordPress from the Voki website is not possible and you must take the above steps to post to your WordPress site. 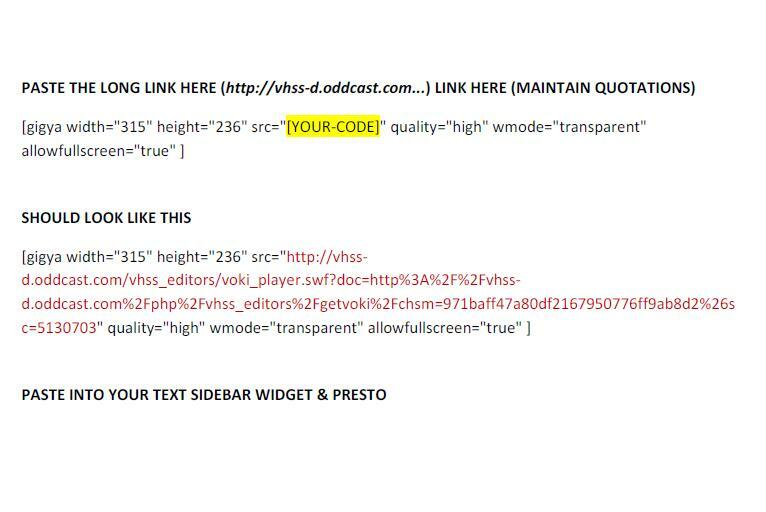 If you would like to publish your Voki as a post rather than a widget, follow the instructions above but use the modified embed code in a “post” rather than in the “text” widget. [gigya width=”315″ height= …. etc.? Is that “gigya” code supposed to appear on the oddcast site? The long web address you show isn’t complete and it is not a link. What do we do when we get to oddcast? All I see is a list of Vokis I’ve made. I am sorry about the difficult instructions. Please email me at feedback@voki.com and we will work this out. Hi, I am doing a project for my ELA teacher using a web 2.0 tool. I choose Voki, but i want to put multiple avatars on the same page, but is that possible to do? Can you put it on a Word Document? and also if not, What should I do? I have 2 days till I present, and i need a clue on where to put the avatars, and how to do it!! I can not add this to my WordPress blog either. I tried as both as a widget and as a post. nothing happened. Yes, why is Step 10 a photograph. I can’t cut and paste the code that way. I tried typing it in but it’s not working. I would avoid any mistyping if you just put the code up there in text. I also updated the blog. We are working on an improvement to this feature which will be launched around May 22, 2012. Please take a look and see what is wrong. Sorry to hear your having trouble with the WordPress directions. This has been a tricky tool for others as well. We are working much better tool for embedding in WordPress – it should be available on voki.com in a few days, so keep a look out. hello, my wordpress left a comment saying no hotlinking please. Can you please help? Nevermind sorry, I logged in and out again later in the day and it worked!! So happy with my blog now, it was the finishing touch it was crying out for!!! On my blog it just shows the text not the actual Voki. Thank you! I had not been able to add my Voki to my blog until I read this. I’m not seeing the section that you wanted to add the Voki to. Can you send me a link to your Voki so I can take a look at it? We will get back to you as soon as we can! Stay tuned!